Heather of Flying Fish in Big Pond has requested if I could share tips about locating bargains and authentic goods on eBay. I've been buying and selling on eBay for slightly over a decade. The marketplace has its pitfalls but if you know what you're looking for and have done your research, you're bound to save yourself quite a bit of money. Many of you have asked about my Repetto flats. Most came from eBay for a fraction of the retail price saving me at least £100 - £150 per pair. My latest obsession is Geodesis reed diffuser which costs £35 a bottle but I found them on eBay for £17-20 each. I've bought Chanel handbags for USD 450 in the past at a time when I was a little crazed for the brand, designer coats for Lil L for £25 saving myself £50 in the process, brand new unwanted Hermes shawl for £200, Hermes enamel bracelet for £50 amongst some of the bargains I've nabbed on eBay. Whatever you want to buy, it's important that you know the retail price, size, fit and the going rate for it on eBay. Have a figure of the price you want to pay in your head. One of the things I do a lot in the name of research is to pull up completed listings. This will give an indication of the kind of prices you'll be paying for similar items. It's not too bad if you're looking for inexpensive goods but once you start thinking about high value items, it pays to look at the seller's feedback very carefully. Does this seller have a history of selling similar goods? What does her buyers say about her? You can take a step further by checking her on Toolhaus. I tend to go for sellers who have a near perfect feedback record of 99.2% and above. Sellers are generally more amiable to negotiation when a Buy It Now item has been re-listed over and over again with no takers. A polite and well worded message with a reasonable offer will often result in a positive outcome. As a seller, I've received text like messages demanding for a 50% discount with subsequent ones which were borderline harassment. This bargaining method may work well at an Asian night market but not on eBay. If you're planning to buy from an international seller, factor in the shipping cost and duties. Countries such as the U.K, New Zealand, Taiwan, Philippines and Canada tend to have more stringent customs. Any packages shipped using a fully trackable service such as UPS, FedEx, ParcelForce and EMS tend to attract duty charges more so than standard airmail delivery. It's all too easy to get into a bidding war which drives the price through the roof. Great for the seller but not so good for the bidder. On the flip side, I've also managed to lose out on great deals thanks to my slow internet connection while trying to bid last minute or worse still, I'd completely forgotten until the auction has ended. I use Auction Stealer which gives 3 free snipes a month. I've read good reviews for Goofbay which is also free. Insert the highest amount you're willing to fork out for the item and it'll snipe within the last 3 - 10 seconds to go. One of the biggest drawbacks for most eBay bidders is the potential of buying a counterfeit item. I've been burned a couple of times. I've also been contacted by bidders to authenticate designer bags fearing that they might've been sold a fake. The bottom line is if it's too good to be true, it almost always is. I've had my share of buying designer bags at crazy prices but you'll have to know what to look out for. There are genuine sellers who have no idea the value of the items they're selling. They are in the minority. The rest are crooks. It's far easier to expend the extra effort of authenticating the listings before bidding. Trying to recover your money after payment can be an excruciatingly stressful process. If the photos are insufficient or blurry, email the seller and request for more. When you're buying a designer bag, it's important that you see plenty of clear close up photos of any blindstamps, markings, interior and stitches. The telltale signs are in the fine details and finishing. Walk away if the seller refuses to provide additional photos or information. The Purse Forum offers free authentication service, thanks to the generosity of their members. Caroldiva (Louis Vuitton), Bababebi (Hermes) and Etinceler Authentications (Chanel) will provide written authentications for a fee should you require the service during a Paypal/eBay dispute with your seller. Don't limit yourself to one eBay site. I've purchased from both eBay.fr, eBay.co.uk and eBay.com. 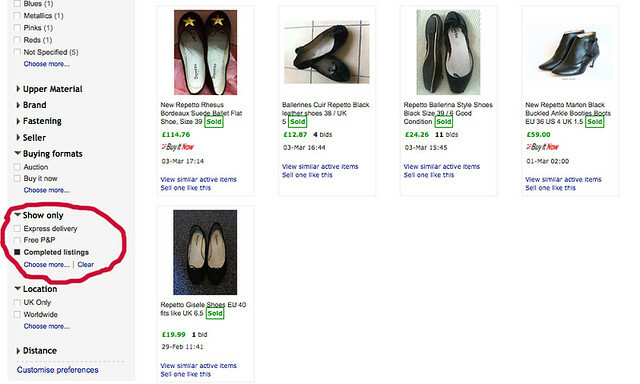 I've noticed in the past that it's harder to find Repetto flats at basement prices on eBay.fr as they're in great demand there. Instead, I'd search on eBay US and UK sites. Likewise, I've had a higher chance of nabbing a greatly reduced Isabel Marant jacket on eBay FR site. Try searching for Louis Vutton, Channel or a variety of commonly misspelled designer names and you might hit the jackpot. Better still, you can use Goofbay to help you out. In order to locate a bargain, you'll have to be patient. It may take a couple of days, several months or heck, even a year or two to find your holy grail at an affordable price. You can trawl on eBay once in a while but it can get a bit tiresome to type in the same keywords all the time. 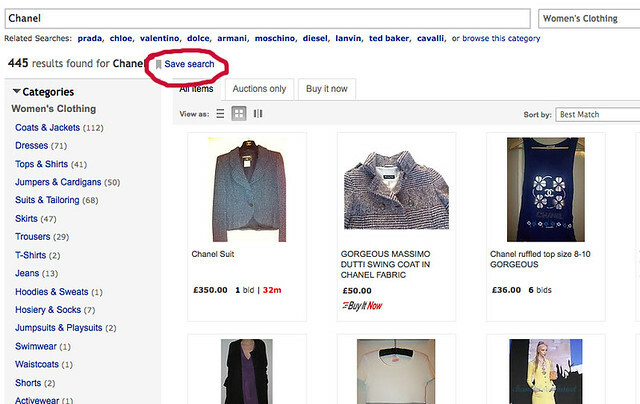 To save yourself a bit of time, click on Save Search and have eBay email you with new listings. For those who are unused to eBay, I hope this will alleviate some of your fears. Happy bargain hunting! I very recently got into using Ebay and was amazed at how quickly I shifted my unused items - I managed to sell a handbag and get the price I originally paid for it back, allowing me to invest in a new one which will be much more appropriate. I also found an amazing charcoal wool jacket from Toast (originally £250+) on Ebay last week which I bought for £35. I was really worried that it would be in a very shabby condition upon arrival as the photos of the item were quite poor, but it was perfect and had never even been worn! I was glad to have trusted the seller's 100% rating. £35! Oh wow, that IS an incredible deal! It's fantastic that you managed to get your money back for your handbag. Jennifer, I'm pleased that these tips may come in handy. It can be a daunting experience. My advice is to start buying a few things that you need to get anyway on eBay just to get some feedback and used to the process. eBay can be a daunting experience but once you know what pitfalls to avoid, you can hit the ground running. Beware, it can be addictive! I'm more of a BIN girl. In this case, instant gratification is awesome! Brilliant post! As a newly avid Ebayer all the advice I can get helps. Until very recently all my designer goods were purchased from a store as I never wanted to take the risk of getting hold of a fake! In your previous post titled, 'How to be a Recessionista' I mentioned that I had made an Ebay purchase. I took the plunge after reading a post by Brooklyn Blonde, she had just bought a jumbo CHANEL bag and offered a few EBay buying tips. So I scoured EBay and managed to find a small Chanel bag for 1/3 of the RRP. I took a bit of a risk as the buyer only put one photo up but I went buy her previous record (she has had an account dating back to 2001 with 100% good feedback) and I also checked the other items she was selling. Even after my purchase I took it to a Chanel boutique and got it authenticated. Was so relieved and happy to be told that it is the real thing. woohoo!! I'm so pleased for you, Parveen. Chanel prices are crazy these days. What a bargain picking up an authentic Chanel bag for 1/3 of retail price. Very interesting post !! Thanks for sharing !! Thanks for sharing these tips. My Ebay experiences over three years have been mixed, more hits than misses . When I say misses , only one gruesome fake Hermes mousseline. The other misses were completely down to lack of judgement , and also getting swept up in the 'fun' aspect of it ! But offloading mistakes is fairly easy , so I still love it . That's great if you could offload it. It's worth it if your hits are more than misses. interesting post! I have noticed a lot o the times items would be sold really cheap but the shipping would be almost double the usual price! Oh yes, that's how to make money through shipping and reduce their eBay fees drastically. Great tips! I need to do more of this - my wallet will thank me! You bet! Your bargains are legendary. I'm so glad this will be helpful. Have fun spending your PP money! u have so many great tips!! it def requires lots of patience & attn to detail to shop on ebay for designer goods. i've lost a few auctions before due to my slow internet too!! but usually i am relieved bc i tend to get so caught up in bidding, i forget to pay attn to how the price has actually gone hahaha a lot of the times the prices get driven up so high, it's not really a good deal anymore. I agree. Tons of patience to trawl through listings. It's all too easy to get into a bidding war too. Great informative post. I've gotten some nice bargains as well as great finds that were still expensive but cheaper than retail on eBay. I used Caroldiva's services once for a fake LV auction and was extremely happy with her service. It's painful that eBay automatically takes the seller's side in a dispute, so as you said, do your research first! Thank you! Glad you like it :) Carol's very prompt with her replies. Fingers crossed I haven't had to deal with a dispute for a while but yes, it's a very painful process. Awesome tips on buying and selling, I'll be sure to keep them in mind. Thank you very much.